We adopted our dog, Choco, 4 1/2 yrs ago from the Animal Rescue League here in Boston, MA. I love dogs and had not had one in a long time. My husband never had a dog and my sons had collected over 100 stuffed doggies. One of my twin boys had said we should get a puppy now that I was getting better. He was almost 7 and I had just finished chemo and radiation for the 2nd time. Our other landlord had made us move and so when we moved to our current house, I told them that if they were good, we would get a puppy. 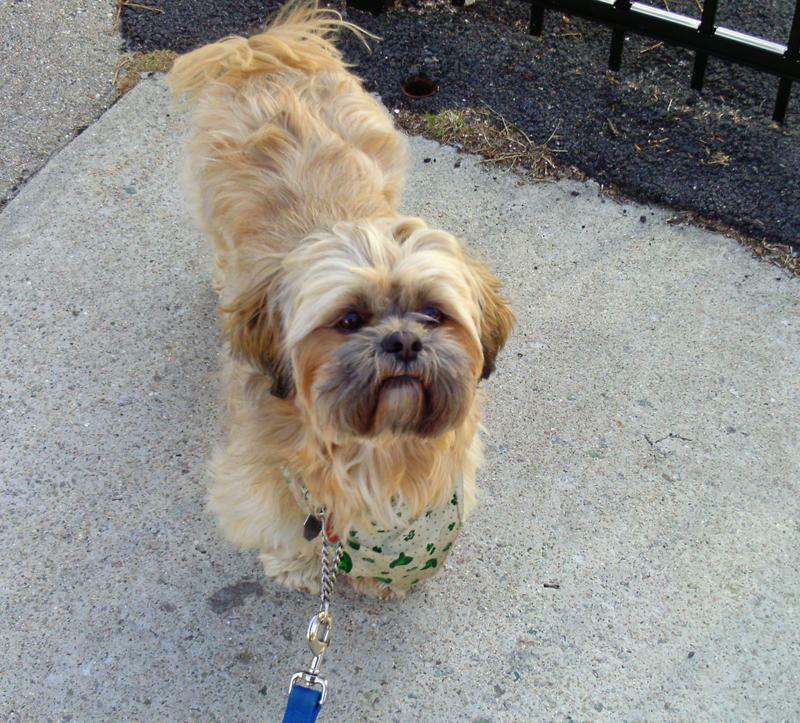 One day I was looking online and I saw that they had a Shih Tzu for adoption. The people who had him could not take care of him or his siblings, so when I saw him I just told them I wanted him. Choco was so cute and cuddly that he just had to go home with us. My hubby even said it was cool and he was then 46 and never had a dog. So I told them I wanted him and we went thru the whole adoption thing and the next day I brought my 3 sons in to see him. It was love at first sight!! He has brought so much happiness to this house and, even better, he has made my hubby into a dog lover. Choco pulled my spirits up after all that I had went thru from my cancer treatments. And he has made my boys into more responsible children. They take him every where. Choco has become the school mascot in a way, and he goes to all of their sporting events. They say dogs are man's best friend, but in this case he saved me when I was so down. Choco made me think about all of the good things and he has made my family whole again. And now he is the king of his castle. My husband misses him so much when he is on the road; he wants to take him over the road in the truck. But the boys have told him, "No daddy; he has to stay home until he gets older." I love my furry baby so much and when you look at him you can see why. Do you have a RESCUING ROVER story that you would enjoy sharing with our readers? You can submit your story to AllThingsDogBlog@gmail.com. Please include a photo that you have taken of your dog, and tell us all about your experiences with adopting and owning your pup. Your story must be less than 500 words to publish. We look forward to hearing about your Fido. Choco sounds so sweet! I love how dogs can lift spirits almost immediately. What a great story and such a beautiful dog. They definitely can change our lives in many wonderful ways.